It's not that the dawn of spring was a false one but I've really done very little gardening since the last post here. Did get the onion sets in, plant out the Martock beans and do a small amount of preparation for the next season but now, I'm all behind. Although the peppers and aubergines have been started for six weeks or so now, I've been holding off and holding off on the tomatoes because transporting huge lanky plants across the channel is highly inconvenient and yet I can't start the seeds in France unless I'm there to provide heat and management, which means they'll be far to late to be useful. Finally I've decided that something must be done, and I've done it. 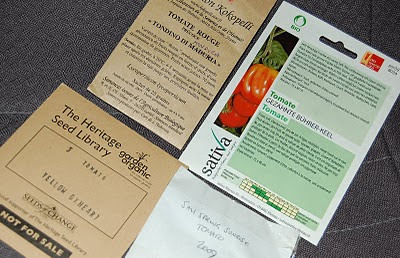 The tomato seeds went in today. Normally I agonise over the selection, trying to balance quality of fruit against weather and blight tolerance, thinking ahead to what I plan to do with the harvest and so on but this year the choice is nearly a lucky dip. First up, the Gezahnte Bührer-Keel which I first saw on Flickr in a friend's stream here. After I begged shamelessly, Herbi very kindly obtained and sent me two packets of seed for this variety. It's a very old Swiss-Italian variety, with deeply ribbed pinky green skin and dense dry flesh. Needs warmth and to be protected from rain which might be a challenge in Normandy but I'm feeling excited about this one. Then, another one with a difficult name. The Tondino di Manduria isn't even consistent on the Kokopelli website. It was a freebie sent with the rest of my Kokopelli order and I think it will be a small plum tomato. Worth a try I think, good summer permitting. The Yellow Oxheart came from the Heritage Seed library. I'm hoping it will have some useful character, since yellow tomatoes I've grown recently have all been a bit disappointing. Trouble is, the big Oxheart type toms all require excellent conditions to produce well. Maybe this is the year I need to get that greenhouse built. And soon. Finally, the Salt Spring Sunrise. My own seed saved from last year, this variety, which I just don't seem to be able to get rid of, has made itself a place in my heart. It's tough, reliable and if it's not fully gourmet it's certainly good enough to eat.